Only one handheld was ever able to hold out and steal enough of the market from Nintendo; Sony’s PlayStation Portable. With it’s ability to play games, movies and music from either a memory stick or a UMD, the PSP was able to hold on, even though the first few games were mediocre. As the years went by, the game improved and the PSP even broke Nintendo’s dominance, at least in Japan. With the Vita, Sony shows that it has listened to some of the criticism of the PSP. The Vita has two analogue thumb sticks, which allows similar controls to some PS3 games. The shape is similar to the classic PSP style, with the Vita being slightly longer, wider, but not thicker than the classic PSP. The D-Pad and the four standard PlayStation buttons (Triangle, Square, Circle, X,) are smaller, as to accommodate the two thumb stick. Like the PSP and the Go, it has the left and right shoulder buttons. Unlike the PSP and Go, the Vita includes a touch screen in the front and a touch pad in the back. the Start and Select buttons are under the right thumb stick and the PS button, similar to the one on the PS3 and PSP Go, is under the left one. The Vita’s O/S is all new, taking a cue from the smart phones and tablets. Applications and games are started by pressing the apps icon on the touch screen. Navigation is done by flicking the screen up or down, or left or right. The PS Vita comes with apps for internet, trophy support (through PSN), the PS store to by games and movies, friend chat, a camera app (for the built-in front and back camera) and “Near,” and app that uses Google Maps to track where you are and where other Vita owners are. Creepy. Now, for memory. Like the original PSP, there is no internal HDD for storage of saves and media. Once again there is a expandable memory slot. Sony has decided to use a new format for its memory. These PS Vita memory cards come in 4 to 32 GB and are sold separately, though the First Edition preorder pack comes with a 4 GB card and a few stores are offering 4 GB memory stick with preorders of the regular Wi-Fi module. The system plays well and looks great. Battery power consumption is similar to the 3DS, with a 4-5 hours of playtime per charge. Using Wi-Fi drains the power faster, as usual. You can play on the Vita as it charges, though. -includes the Welcome Park App, a game/tech demo that lets you try out the different features of the Vita. You use the motion controls, camera, microphone, touch screen and rear touch pad. -Friend List/Group Messenger: talk to your PSN contacts. -Near: As said above, track your movements and other PS Vita users near by. You can send and receive gifts, in game items for titles that support it. -Backwards compatibility: The Vita can download and play about 250 PSP games. You have to re-download them from the PS store through the Vita to use them as the format gets changed. If you have your PSP saves in your PS Vita folder on the PC,you can transfer you saves. My Take: This is a great system. Unlike the 3DS that is just a DS with a crappy simulated 3D, the Vita is a next gen handheld. The games I’ve played use at least one of the special features like touch, if not all of them. the one thing that irks me is the switch to a new memory format. I have all these memory stick Duos/Micros lying around and now I have to get another type? I understand the Sony wants to make money, but at least include a 4 GB with the unit (as said before, the First Edition Bundle came with one and some stores may have a pre-order deal for the base model). At $249.99, the price is as much as a PS3, but it is worth it. Compared to, say, an iPad, it is not so much. 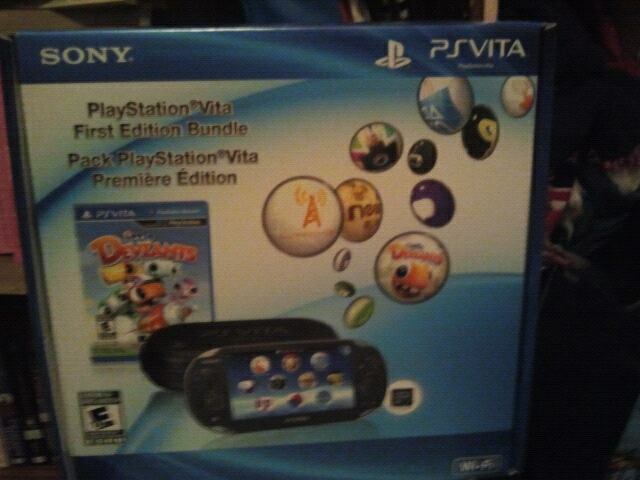 But Sony should not lose sight of the fact that the Vita is, first and foremost, a gaming machine. Watching movies and listening to music is a great feature, but no one will buy one for that reason. I’m sure there will be apps like Facebook and Twitter, but it will be the games that sell it. If you in the market for a new handheld that offers something new, this is a good choice.